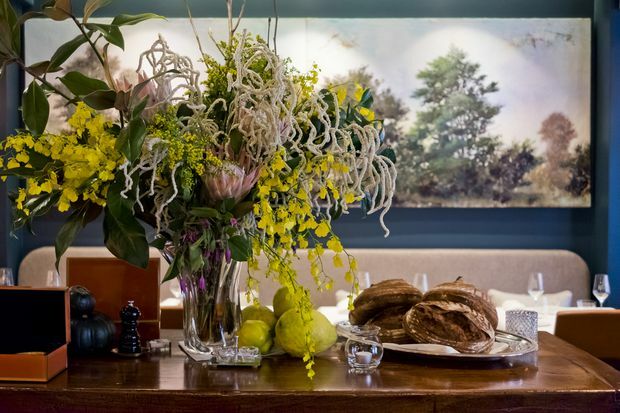 Less than five months after opening Comice, a contemporary French restaurant in Paris’s 16th arrondissement, husband-and-wife team Noam Gedalof and Etheliya Hananova, chef and sommelier respectively, reaped the food world’s ultimate recognition when Gedalof was awarded his first Michelin star. Days after his extraordinary win in February, Gedalof, 36 – who trained in restaurants in Montreal, where he also met his wife – reflected on his bucket list of dreams, the secret to success (hint: he married her) and the power of good old-fashioned Canadian hospitality. I studied classics, but I wanted to get out of academia. I worked in trading firms for two years, but I wasn’t very happy, so I decided to work in a social milieu. I went to work in a restaurant in Montreal called Kaizen, in the dining room and I was enjoying it. Then there was an opening in the pastry kitchen. I really loved it. I think what I loved was working with natural products, working with my hands. It was also kind of technical. One of the things we did was make soufflés. That’s actually something that we do at Comice and it’s one of our signature desserts; we make soufflés to order by hand. We did it with a mixer at Kaizen. For me, it’s funny to make soufflés these days because it’s the first thing I learned in the kitchen and to this day it’s still something that I find passionant [exciting]. Noam Gedalof and Etheliya Hananova at Comice in Paris. About a year into working at Kaizen, I discovered The French Laundry Cookbook. It was the turning point for me because I saw the true potential of the profession. 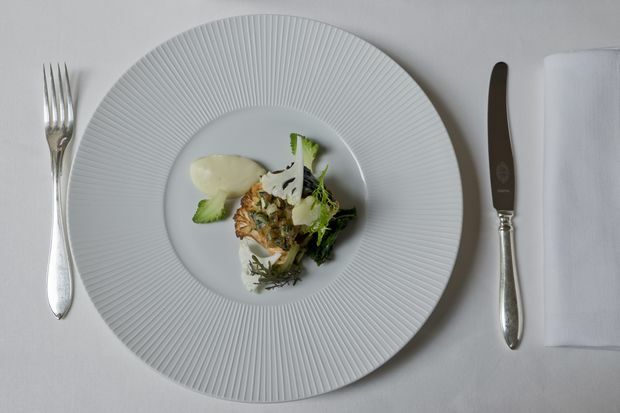 Thomas Keller, the chef of the French Laundry, is an obsessive perfectionist. I wanted to learn from this guy. So I decided that the thing to do was to go to cooking school in Napa Valley so that I could maybe get my foot in the door. I had a tremendous experience in cooking school. Then I had my internship at the French Laundry. It was very exciting, but also very challenging. I was a bit older, 25 or 26, and I had little experience, but I made a good enough impression that I connected with the chef de cuisine, Tim Hollingsworth. I went back to Montreal after my internship because my visa expired. I worked at a fine-dining restaurant called Brontë for a guy named Joe Mercuri, but I stayed in touch with Tim. Then about nine months later, Tim said, “I’m rebuilding the team.” He said they would sponsor me for a multiyear work visa. It was a dream come true. I didn’t have a ton of contact with Thomas Keller during my internship, but when I went back I had a lot of meaningful interactions with him. He showed me how to do things like butcher a pig’s head, clean a veal filet. I wasn’t scared to ask; I wanted to get close to the source. I had the great fortune of doing an event with him where we cooked a dinner for about 20 people and it was just me and him. That was an extraordinary evening. We did prep work together, and at the end of the night he swept the floor. I worked at the French Laundry until the end of my visa. After that, I wanted to go to France. Thomas wrote me a bunch of recommendation letters and I reached out to a lot of people in France. I had some people who were interested in hiring me, but then I got an offer in Montreal to be the executive chef at Kaizen, the restaurant where I started. I worked there for about a year, then I decided I wanted to get back on track with my goal of coming to France. I met Etheliya a few months before I left Kaizen and on one of our first dates, I asked her if she wanted to move to France with me. She said no. But, as Etheliya says, I always get what I want. Etheliya comes from a restaurant background. Her family owned a couple restaurants in Winnipeg. Family-style, Russian deli type restaurants, with grandmother cooking, the parents managing and serving. 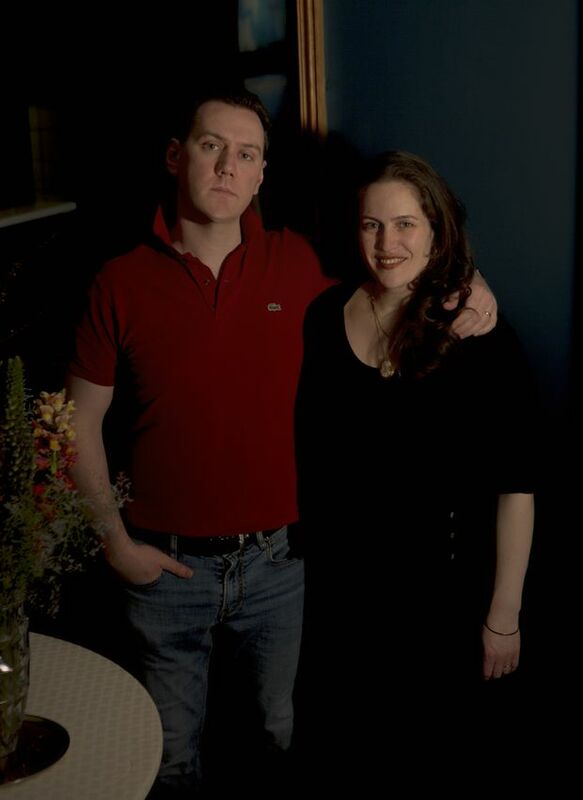 She worked over the years in many of Montreal’s top fine-dining restaurants: Lawrence, Club Chasse et Pêche, Club des Pins, Les Caprices de Nicolas, Brontë – she worked there before me. I finally came to France to do a stage (internship) at a three-star restaurant called Astrance with chef Pascal Barbot. He introduced me to the owner of a one-star restaurant called Le Sergent Recruteur; they had a position of chef de cuisine and a position of head sommelier. So it was a dream come true again, this time for Etheliya and me. After a year and a half, we decided that between the two of us we had 30-plus years in the business. Let’s do something together. My dream was to have a fine-dining restaurant in the countryside, like the French Laundry. But after spending a couple years in Paris, we really loved it here. We did what we thought this market needed, a fine-dining restaurant that married the precision, elegance and refinement of classical French restaurants with all of the warmth that we know in North America. One of the things that Thomas Keller said to me when I was leaving the French Laundry was, “It’s all about relationships. A restaurant is really a community.” That’s something that I always remember. He also talked about the importance of service and how it was one of the things that helped him to succeed. Ultimately, it’s about an experience. It’s not just about the cuisine. It’s not just about the wine. The dining room at Comice. 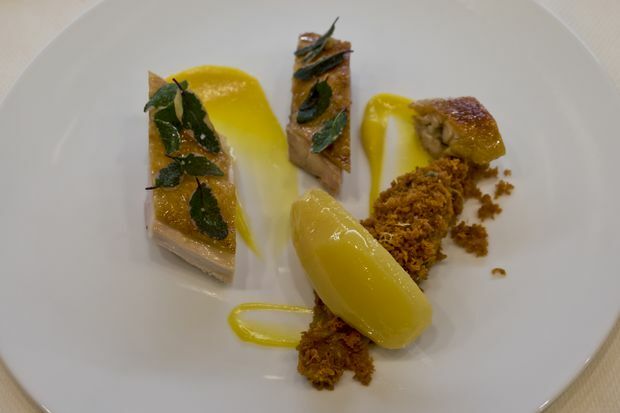 Roasted poultry, sage, quince, endive, brioche and citrus paste at Comice. Obviously, it was a quite an extraordinary moment getting a call like that. And then we go and look on the internet and it turns out he was the guy who had lunch with the inspector on day eight of the restaurant. The president of the Michelin Guide was his guest. Receiving a Michelin star means that we are part of a community that includes a lot of people who inspired us to be in this profession. I have been preparing for this for more than 10 years. Michelin star chefs and restaurateurs are people who dedicate their lives to their work, and I think that that’s noble. And that’s what we’re doing – we’re one of them now. As told to Patricia Gajo.